When you arrive at our inpatient unit, you can expect a warm and friendly welcome from our specialist team whose top priority is your comfort and dignity – we are here to help you and your loved ones in any way we can. We offer a wide range of support and services for patients and their families. We have specialist counselling and chaplaincy teams on hand to help with your emotional and spiritual well-being. We embrace all faiths and belief systems, and our Chapel is always open. Visiting hours for the inpatient unit are usually unrestricted and our hospitality embraces the whole family. Our relatives’ lounge has comfortable sofas, a TV, kitchenette and complimentary refreshments. Snacks are available 24/7 and, subject to availability, we can provide hotel-style overnight accommodation on-site. Our patients’ lounge is a place to chat, watch TV, have a meal with your visitors and entertain the kids with a selection of toys at hand. Children and pets are welcome and are often seen about the Hospice. We aim to meet the needs of all our family members and will do our best to make your time with us as stress-free as possible. 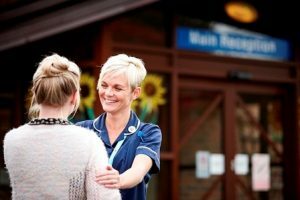 Our nursing team will try to help with whatever’s going to make a difference to you – whether it’s a spell outside in the gardens, a soak in the bath or something more ambitious. We’ve held weddings, arranged christenings and often host birthday parties, our aim is to create happy memories.